Here, they were born, survived and died. Jimi Yamaichi shows us where the red cinder path, M Canal and the cemetery are on the map of the Tule Lake Internment – Segregation Center during World War II. He speaks of possible remains and what his ambulance driving brother-in-law did when the morgue was full. 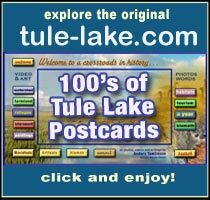 Scenes from the Tule Lake Pilgrimage ceremony for the camp dead concludes this episode. The officer housing section area is now know as the Goosenest. Jimi uses a Tule Lake Internment – Segregation Center map with a legend showing places that still remain. In this segment Jimi talks about the officer housing section area that is now know as the Goosenest and still functions as housing after 1943 this area became the main entrance to the camp. He also discusses the sewage system and a string of wells that ran along the train tracks. These map – tour sequences were filmed March 2004. Coming and going by rail. 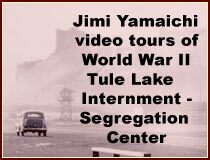 Jimi Yamaichi out where Tule Lake Internment – Segregation Center storgae and packing sheds still exist. he also points out where railroad spurs and switch tracks were.